Chelsea Wolfe, Girl Loves Dead Boys, Opened Paradise, Sweet Ermengarde, Dr Arthur Krause and more. 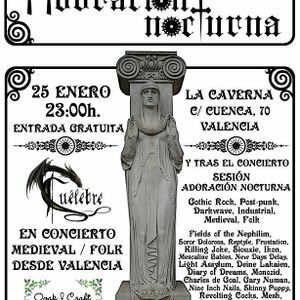 Sesión de 50 minutos que mezcla los temas pinchados en la fiesta Adoración Nocturna del 25 enero de 2014 con otros nuevos, orientándose a los estilos Gothic Rock, Deathrock, Post-punk, Darkwave y Coldwave. 50-minute session that combines songs from Adoration Nocturna Party in January 25, 2014 with new ones, orienting to Gothic Rock, Deathrock, Post-punk, Darkwave and Coldwave styles.